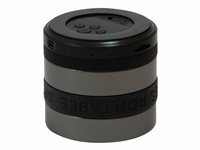 The Conceptronic wireless Bluetooth Super Bass speaker is a wireless 2.1 Bluetooth multimedia device which can be connected wirelessly to a Bluetooth mobile phone, PDA, laptop or PC. This innovative speaker is designed to look like a camera lens, with the volume controlled by twisting to find the right focus, just like a real camera. As well as playing your favorite music, the speaker also enables hands-free speech in the office or home, offering top quality audio and voice clarity. With a hardy, compact design, this versatile speaker is an ideal travel solution as well as a super-handy device for around the house.